Scott Baker is a senior majoring in petroleum engineering at UT Austin. He has worked two internships for Devon Energy and will work for them as a full-time reservoir engineer upon graduation. In a New York Times op-ed article, Erle C. Ellis, an associate professor at the University of Maryland, states that overpopulation is not the problem we tend to believe it is. Ellis’ main argument is that the technology will always be ahead of the population growth. In other words, new technology always has and always will be the solution we need to live in a society with exponential population growth. There is one fundamental error with this reasoning. Ellis acknowledges that “populations must have their limits and must ultimately reach a balance with their environments.” I agree with this statement. However, I believe that the same argument is valid for technology itself. It is evident, as Ellis points out, that technology has always been ahead of the population growth. As with just about every measurable rate in the world today, whether that’s production rate, population growth rate…etc., there is always a limit. To suggest that technology has no limit is essentially suggesting that in our current society, we aren’t in danger of wiping humans off the face of the earth. We have created a world in which fossil fuels are the backbone of every imaginable process. The most notable impact of this is that in order to progress technology, we need energy from fossil fuels. Due to the shear number of people on this planet, we are consuming far too much energy on a day-to-day basis. Ellis also suggests that technology allows us to increase land productivity. This is also true, especially if you consider the inventions during the Industrial Revolution, for example. Inventions in the more recent past have also allowed us to increase population density by increasing land productivity. Yet this brings me back to the point that in order to come up with these inventions, you must have a source of primary energy. Those sources are finite. As we continue to live the way we have always lived our lives, we will eventually come to a point where we can use the remaining energy to live our spoiled lives, or continue to research new technologies. To the average human, it is likely the former will win that battle. Therefore, this again suggests that technology will eventually hit some sort of limit. When a technology growth limit is reached, we are in a world of trouble. The population today is far too great to be sustainable for long periods of time after technology growth drastically slows. Ellis brings up many great points, yet he fails to realize the extent to which fossil fuels are the backbone of our society. Technology is bound to reach some limit in the future, as is population growth. I fear for the day in which the population growth rate exceeds the technology growth rate. In her past academic life, Sarah Christian intended to be a biological oceanographer. By chance, she found herself in a geology class and now is in the third year of her Ph.D., studying sand dunes and aeolian stratigraphy on Earth and Mars. Clearly, overpopulation is not the problem. The true problem elucidated by Ellis’s opinion piece, despite his claims that it is not Earth’s finiteness but rather our technologies and social systems that fail to sustain us and are themselves the problem, is the perpetuation of a pseudo-scientific argument for and belief in the infinite sustainability of human-engineered ecosystems. Indeed, it is eminently comfortable to disavow any connection to this capricious and awful thing called Nature, and, like the mythological gods, to rest assured that if a garden is needed, it can be created in a matter of days. Ellis enjoys the status of godhood; he insists that we exist above Nature and may, if slightly more imaginative, create a garden from nothing. We are not, however, gods above Nature, and this is the first of Ellis’s misbeliefs. He claims that the conditions upon which humanity has survived “are not natural and never have been,” and he cites as evidence social hunting, the use of tools, and diet diversification, all employed for the purpose of extracting additional nutrients from the environment. Would it shock him to know we are not unique in any of these? Dolphins hunt in pods to cause fish to school, sea otters use rocks to break open clam shells (and then store the favorite rock in an underarm pouch), and, in a textbook example of a top-down trophic cascade, the decline of sea lions in the Aleutian Islands led to orca diet diversification and a subsequent shift in the near-shore ecosystem off of the U.S. west coast. Perhaps these animals, equally apt to modify their immediate environments to extract additional nutrients, should join Homo Sapiens in the ranks of godhood? Or perhaps humanity is not so unique and the sole difference is the sheer magnitude of ecological change humans have precipitated. After all, what god notices when a sea otter renders invalid the hard shell of a mollusc? But what an amazing accomplishment when you feed and clothe millions at the expense of a few handfuls of species in the rainforest! 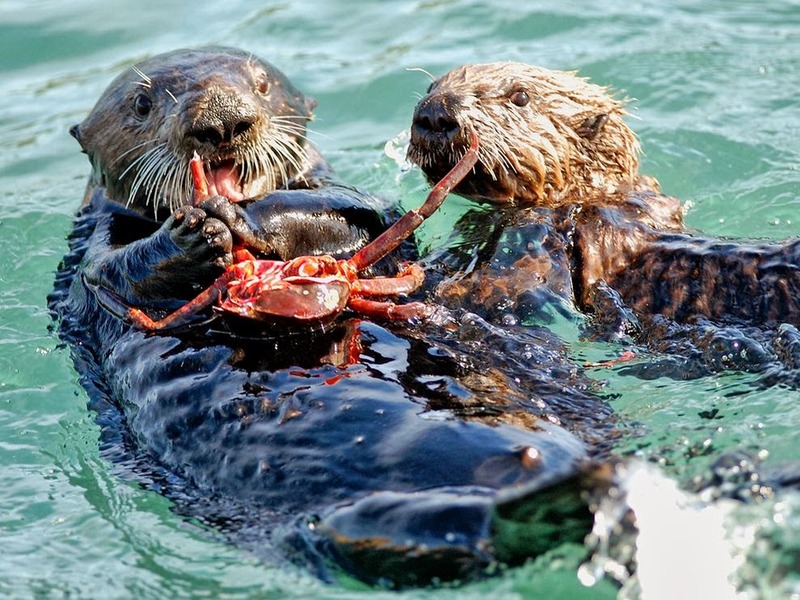 Two sea otters thinking hard how to best deal with this crab. Image source: National Geographic. But, being the most clever of Earth’s inhabitants, humans can re-create the rainforest, if not resurrect the species. In fact, humans do not exist on the principles of mere biology or within the “natural environmental limits of [the] planet”, but rather on the ethereal mana of exponential population growth and economic success. Indeed, these insubstantial things drive the creation of the garden out of nothing. Herein lies the second of Ellis’s misbeliefs, and an abuse of well-used ecological rhetoric. In analyzing the ability of the environment to support the human population, Ellis defines the carrying capacity of that environment in terms of humanity’s skill in extracting nutrients. As such, carrying capacity scales proportionally with humanity’s increasing talent to exploit, infinitely. By abandoning the constraint of the net energetic value of all matter in that environment (whether available for extraction or not), Ellis knowingly describes a reality detached from its physical and chemical underpinnings and available to eternal continuance. And, naturally, this means humanity is the preeminent force to “reshape [...] the destiny of an entire planet”. A pity algae did so first. Allison Ginger is pursuing a bachelor’s degree in Petroleum Engineering and will be graduating from The University of Texas at Austin in May of 2014. Advances in technology, namely fertilizer, immunizations, and engines, are the reason humans were able to explode in population and improve their standard of living so rapidly. At the same time, technology will be the reason for human destruction because it has allowed the population to grow so large. The problem with believing that technology and social development will save humanity from overpopulation is that the solution to overpopulation requires time and money. How do you stop desertification in Africa and turn existing soil into soil able to produce agriculture that will feed millions? How do you create fresh water when industrial wastes are being poured into rivers in China and India? How do you stop climate change when it has been going on for millions of years? The simple answer is that we can’t. Technology that could solve those problems will take too long to be developed before it is too late, especially if the world’s population and energy consumption continue to climb exponentially. Every system has its limits and equilibrium. The question is when will the limit be reached and how will the environment force humanity to return to equilibrium? Everything we have on this planet is a limited resource. Things that humans have taken for granted –clean fresh water, petroleum and coal – take millions of years to replenish. Forests, soils, and animal populations take thousands of years to repair once disturbed, and humanity has managed to destroy this endowment in less than a hundred years. The world does not have time to wait for these essential resources to be replaced, especially if the world reaches the predicted population of 9 billion by 2050. Many things humanity has done to damage the environment (especially the pollution of drinkable water) are almost irreversible, especially in the near future. Most of the current technologies to turn salt water into freshwater, harness solar light, and utilize electric power in a car motor are extremely expensive and out of reach for the majority of the population. The production of many of these alternative energy sources also requires a large consumption of energy (which emits carbon dioxide into the atmosphere) and results in industrial waste. Perhaps the most devastating disease to humanity is the mentality of laziness and wastefulness that has developed. Laziness within the younger generations will hinder the development of the intelligent children that would become the future engineers and innovators in technology. Instead of learning with books, children grow up using IPads and watching mindless television. Wastefulness is one of the worst plagues to humanity. The most developed nations consume the most energy per capita, far more energy or resources than are necessary to survive or to even live comfortably. If all countries were to strive to raise their standard of living to say the United State’s standard, the world simply could not accommodate the level of consumption that would result. I personally consume 25 times more energy and 63 times more water than it takes to live. If there were 9 billion of me around the world, there would be rolling blackouts, rivers drying up, and thick smog all over the planet, not just in developing nations. The key to stabilizing the human population and avoiding extinction is to limit our consumption, increase the efficiency of alternative energy sources, and to stop exploding our population. Although I do not approve of governments creating a law limiting parents to one child, I think it should be highly incentivized. We cannot continue to live in a world with no consequences. The result of the overpopulation and overconsumption of the Earth’s resources will not be a happy ending. If we continue this destructive cycle of using resources carelessly with no consequences, the planet will fight back, causing the population to shrink in destructive ways. Zacharias Petrou has a Diploma in Applied Mathematical & Physical Sciences from the School of Applied Mathematical & Physical Sciences, National Technical University of Athens, Greece. He is now as Master of Science student in Engineering Mechanics at the Department of Aerospace Engineering & Engineering Mechanics, The University of Texas at Austin. Let’s consider a rough mathematical model for the earth’s population and its exponential growth. Let y be the human population in the future, x time in years from now, and C=7x109 the current human population and the mathematical model be the following, Cerx, where r is the fractional growth rate, say 2% per year. The earth’s mass is approximately 6x1024 kg. Let the average mass of a person be 65 kg. This means that the earth’s mass equals the mass of approximately 9x1022 people. If the human population continues to grow in exponential rate then, using our mathematical model, we can see that in 1,500 years the mass of human population will be equal to the mass of the earth! Having in mind the principle of conservation of mass this means that all of the earth’s mass will recycled into people: Clearly impossible. There is no dispute that Earth and its resources are finite. There is no dispute either that all living creatures on Earth need air, water, and food to be kept alive. Even if we assume that each living organism consumes only its minimal needs during its life, it’s a simple division of Earth’s finite resources by the minimal needs of living organisms to conclude that a finite number of plants, animals and people can live on the Earth. Put simply Earth capacity in terms of sustaining life is finite. I do agree with Professor Ellis that human ingenuity invented and will keep inventing technologies in order to engineer ecosystems to sustain populations that naturally could not be sustained. However, the achievement of the new technologies is to increase the percentage of Earth’s capacity used by us. For example, we can improve our planes to fly faster and faster but we can never exceed the speed of light. We can only get closer and closer to that. The same happens with Earth’s resources. The fossil fuels used nowadays existed also 500 years ago but people were unaware of their existence. New technologies gave us the ability to exploit Earth’s resources in fossil fuels and thus increasing the fraction of the Earth’s capacity used. Perhaps the history of Easter Island is a striking example, among many, of the dependence of human societies on their environment and of the consequences of irreversibly damaging that environment. People with limited resources constructed one of the most advance societies considering the technology they had available. However, the demands by this development were so immense the island could not sustain and the society fell with it. Finally, although human ingenuity can help us sustain greater populations human greed does the exactly opposite. Even when things get tight and sharing is needed there will always exist, as always existed, people who just claim everything they lay there eyes on. Europeans were once forced to explore Earth because Europe could not sustain them anymore. Luckily their explorers found new lands and new resources available, and human kind was able to grow further. But today there is no new land to be discovered! I believe that Earth has a limited sustainability and I hope by the time we reach it we have the means to travel to other planets to new available resources. Then the question will be how many people the solar system can sustain! Clark Thannisch is a senior at the University of Texas where he is majoring in Petroleum Engineering. Clark states: "Although many would see my title and think otherwise, I am in fact very concerned with the future of our planet and the rate at which we consume fossil fuels." 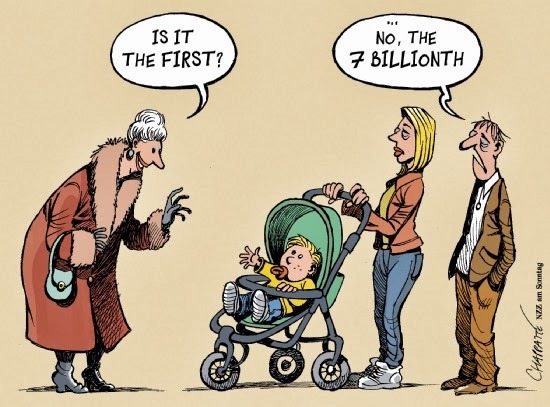 It is estimated that earth’s current population is around 7.2 billion human beings. As our numbers grow exponentially, I am concerned that the earth will soon reach its carrying capacity. We live in a finite world that isn’t growing along with us. In my eyes this is unsustainable and the world population will eventually have to re-adjust itself to a smaller number. However, others, such as Erle C. Ellis, believe that “Our planet’s human-carrying capacity emerges from the capabilities of our social systems and our technologies more than from any environmental limits”(1). While I agree that the population explosion has been made possible in part by our social systems and technologies, I do not believe that these two factors will make our growth continue forever. The main driving force behind our population explosion has been access to cheap power (energy per unit time). Most of this power has come from fossil fuels; for instance, in the United States we have received 80% or more of our power from coal, petroleum, and natural gas for the past 60 years (2). Before these three resources were mass-produced, the global population was around 2.2 billion and people lived on mostly plant carbon. The 5 billion people born since 1940, when hydrocarbon production took off, owe their existence to the Haber-Bosch ammonia process that is used to make fertilizers. This shows that without fossil fuels, we cannot sustain the population that we have today. The minerals in our topsoil are being exhausted and cannot continue productivity without fossil fuel transformed into fertilizers. Fossil fuels are a non-renewable resource, which means that their production cannot increase exponentially for all time. Hydrocarbon production must peak as will the power supplied to the world. Unfortunately, worldwide crude oil and lease condensate production has remained constant since 2004 and shows no signs of increasing. Other fossil fuels, such as gas or coal, have not peaked but combustion of them must decrease because of their harmful affects on our atmosphere. Once hydrocarbon production starts falling it will either have to be replaced or the population must decrease. The first option is impossible because of the unrivaled energy density of hydrocarbon resources. Many believe that the amount of power we receive from hydrocarbons can be replaced by renewable energies in the future with an increase in technology. The reason that this is not possible is due to the nature of renewable energies. All energy on planet earth comes from the sun. Energy either comes in a flow (water, wind, sunlight) or a stock (oil, natural gas, coal). Because the earth could only support around 2.2 billion with flow energy, the rest of the population is essentially living off the stock energy. I do agree with Erle Ellis in that we are a robust and intelligent species that constantly pushes the envelope and squeezes billions of people onto the planet. However, our fate must ultimately be the same as that of the bacteria on the petri dish. Unless we start inhabiting other planets (impossible), we must come to grips with the fact that we live on a finite planet and we cannot keep using as much power as we are today for eternity. Our population must peak and we must begin to live in harmony with our planet if a sustainable/constant population number is ever to be achieved. 1. (1) ERLE C. ELLIS, Overpopulation Is Not the Problem, The New York Times, September 13, 2013. ( (2) 2013 E4 Class Reader. Samuel Winata is a senior in petroleum engineering at UT Austin, but also graduated with a B.S. in Neurobiology from UT two years ago. He is hoping to get into a petroleum engineering graduate school (preferably UT) in order to gain a wider and deeper understanding of this field and its possibilities. Erle C. Ellis’ rather narrow-minded op-ed seems to be the product of an exceedingly anthropocentric viewpoint, one which is perhaps rooted in today’s “Western” – and in particular, American – culture of celebrating and elevating human exceptionalism and socio-technological achievement above all else. Being surrounded by such a culture will understandably bias a person toward exaggerating human potential while underestimating, if not outright ignoring, other factors. Mr. Ellis advocates the idea that human progress is essentially limited only by the human imagination (and, of course, by societal trends, which we will leave aside for now). Frankly, this belief is completely unsound from a logical perspective. Human activity, like all other physical phenomena, is constrained by the laws of physics, although Ellis apparently wants to believe otherwise when he makes statements such as: “Neither physics nor chemistry nor even biology is adequate to understand how it has been possible for [human beings to continually reshape their future and the planet].” A very quixotic statement indeed, as physics must be perfectly capable of describing any and all human possibilities. To suggest otherwise is to say that humans can somehow transcend the laws of physics and simply conjure up whatever bright ideas they might have from the void. Ellis defends his argument by saying that humankind throughout its history has always transformed its environments to suit itself, continually enhancing the biosphere’s human carrying capacity. Certainly this is true – albeit according to select metrics which may not be the best reflection of reality in the long term – but to then extrapolate from this statement and say that we are capable of endlessly redesigning our environment for eternity is highly fallacious. Just because something has happened before several times does not mean it will continually happen forever; just because we haven’t yet hit our final environmental limits doesn’t mean we never will. Lest we forget, the ability to transform our environment is ultimately derived from the environment itself, from the energy and life-support systems which the environment provides us, allowing us to exploit these natural resources in exchange for the ability to alter our natural habitats. Since the environment and its resources are not unlimited, it follows that our ability to remodel the world as we see fit is also restricted. No amount of human intellect or technological wizardry will allow us to transform a limited amount of resources into an unlimited supply of sustenance. As we continue to overburden the environment and unsustainably drain our allotted reserve of resources while proliferating at record speeds, the gargantuan problem of overpopulation will become increasingly clear for all to see – hopefully we will collectively recognize this problem and prepare countermeasures before it is too late. These are very moving comments. Now what's needed is for their authors to _get moving!_ This is going to require a level of rebellious activism that we have not seen in our country for many decades. It will have to be a push--an irresistible push!--by the young. Elders will not, perhaps cannot, make the change. I just had a chance to read through these, and I am blown away by these kids. They are taking these very heavy ideas and realities on their young shoulders. I am completely humbled by them and think it really is time for me to shut up. In comparison, when I was in high school in 1970 (and you and I are the same age) I cofounded a student ecology group, Save Our Society (SOS) We did newspaper recycling drives. And I really believed too that we could change the world by recycling newspapers! Now these young people are really seeing what we're up against much more clearly. No easy fixes, no newspaper recycling drives. A society truly more in peril, with greater income disparity, and all the rest. I question my right to comment on what is ahead for them, even my capacity to mentor them, given that the time I grew up in was the "golden era" with the astronaut at the top of the tower. How that felt is unimaginable to these young people. It is challenging to think about how to support them without discouraging them, literally, because they will need their courage. In the end, I think they will need community, and I hope the methods they are choosing can provide that for them.